Savanna has launched The Vandewater, a 183-unit luxury condo in Morningside Heights. Designed by INC Architecture & Design, with landscapes by Michael Van Valkenburg Associates (MVVA), the 391 ft. tower has 24,000 s/f of amenities. Situated at 543 West 122nd Street, one block north of Columbia University and just south of Columbia’s $6.8 billion Manhattanville Campus expansion, the 33-story tower offers light, air and views of the George Washington Bridge, Hudson River, Central Park, downtown Manhattan and beyond. Located across three floors of wellness living, amenities are inspired by historic residents of Morningside Heights – George Gershwin, F. Scott Fitzgerald, Allen Ginsburg – and include a salon, practice room, great room and club room. As well as private gardens and drive-up motor court, services include a 24-hour doorman, concierge services by Luxury Attaché, a 70-ft lap pool, fitness center, children’s playroom, yoga/pilates room and pet spa. Marketing and sales are being directed by Halstead Property Development Marketing. Studio to four-bedroom residences are priced from $920,000 to $6 million. United Management, together with Reuveni Real Estate, announced that Dahlia — a 20-story luxury residential building on the Upper West Side — has officially “topped off” construction. 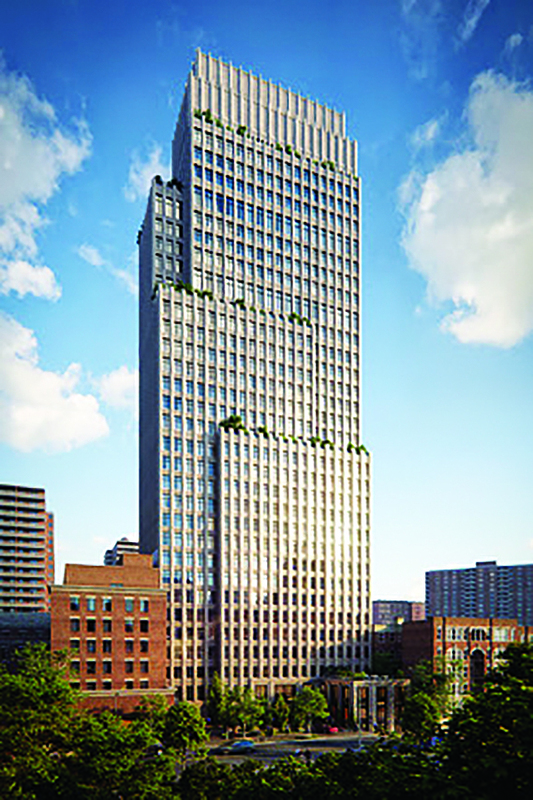 “Dahlia’s symbolic topping off marks a significant milestone for the Upper West Side. After over a decade of stagnant new construction along the Broadway corridor north of West 86th Street, the neighborhood is now experiencing the long-awaited arrival of modern new development product with Dahlia at the helm,” stated Shlomi Reuveni, president and CEO of Reuveni Real Estate. Designed by CetraRuddy Architecture, Dahlia will contain 38 two- to four-bedroom condos, including two penthouses and select homes with private outdoor spaces. RKTB Architects is the architect of record for the project and JRM is the construction manager. The residences will have open layouts and up to 10 ft. ceilings. Amenities will include bike storage, private storage for purchase, limited private parking for purchase, lounge, music room, children’s playspace, a 5,100 s/f elevated outdoor park with playground, pet spa, game room, fitness room, yoga studio, and 24-hour attended lobby. Reuveni Real Estate will be the exclusive marketing agent of record. Occupancy is expected in Spring 2020. Brown Harris Stevens Development Marketing has taken over sales and marketing for JDS Development Group’s 613 Baltic, an 11-story, 43-unit luxury condo In Park Slope. Tim Simmons and Catherine Witherwax of Brown Harris Stevens will be leading the sales. Newly constructed with on-site parking available, Baltic has just a handful of two and three bedroom units still available, according to StreetEasy. The Victor Group and Lend Lease have unveiled a new model residence at 277 Fifth Avenue, the tallest residential condominium on Fifth Avenue. Corcoran Sunshine Marketing Group is the exclusive sales and marketing agent and reports more than one quarter of the 130 units in the modern tower are in contract. Designed by Rafael Viñoly, the tower features one- to- four bedroom residences with bird’s eye city views W and column-free layouts. Two levels of curated amenities connected by a curving staircase include a lobby library, entertaining suite with bar and kitchen pantry, private dining room, kids club, games lounge, fitness club and furnished Fifth Avenue terrace. The full-service offering includes private storage/bike storage, pet priority program, dry cleaning and vehicle concierge.